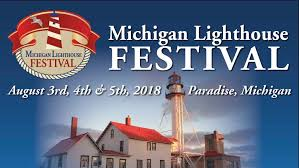 As many of you know, the 2018 Michigan Lighthouse Festival will be coming to Paradise, Michigan this coming August 3, 4 and 5, 2018! Join the Great Lakes Shipwreck Historical Society/Whitefish Point Light-Station, Crisp Point Lighthouse and Iroquois Point Lighthouse for this special event, coming to the Eastern Upper Peninsula for the first time! The 2018 Michigan Lighthouse Festival will start at the Bay Mills Resort and Casino, with a special dinner/concert, on Friday, August 3, by “The Gordon Lightfoot Tribute”, featuring Mike Fornes. On Saturday, August 4, 2018, Lighthouse organization and arts/crafts vendors will be open at the Whitefish Township Community Center (7052 M-123, Paradise, MI 49768) from 9:00am to 5:00pm and on Sunday, August 5, from 9:00am-4:00pm. Special light-station walking tours at Whitefish Point, led by a uniformed Lighthouse Keeper, will take place in front of the lighthouse at 11:00am and 1:00pm. on Saturday, August 4.